Earlier this week, I wrote about my quest for quality pajamas. I recently paid $80 to purchase a pair from Filson, a company I trust for well-made goods. It’s my hope that these will be the last pair of pajamas that I ever purchase. My goal was to “buy it for life”. The first is a company called Best Made, which aims to make and sell “the finest, most beautiful and useful products made by any company anywhere”. And they do. Best Made offers an esoteric collection of clothing and household items, all of which offer quality reminiscent of your grandmother’s era. The catch? The quality comes at a higher cost. Or there’s the Portland-based Schoolhouse company (formerly Schoolhouse Electric), which makes and sells a variety of lighting, hardware, and furniture for the home. I’ve purchased a few things from Schoolhouse over the years, and I’ve been blown away by the quality. The items were expensive up front and I was hesitant to purchase them, but my reservations have vanished with time and usage. The blanket covering my feet at this very moment, for example, cost $250 (I think) but will last the rest of my life. 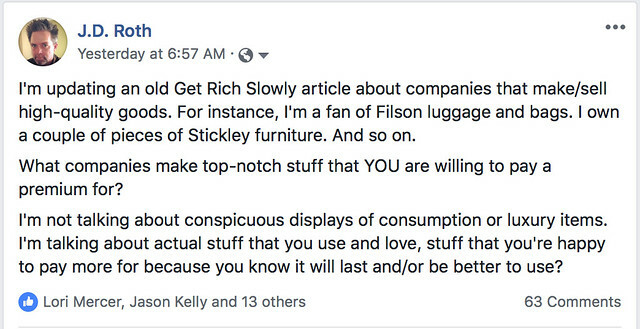 Here’s something I’ve learned over the past fifteen years: One way to practice financial prudence while living the good life is to buy quality products, products that are a pleasure to use, products that will last a lifetime (or at least a decade). Today, let’s talk a little about choosing quality over price. Let’s talk about the “buy it for life” philosophy. The first challenge is to figure out how to find the good stuff. 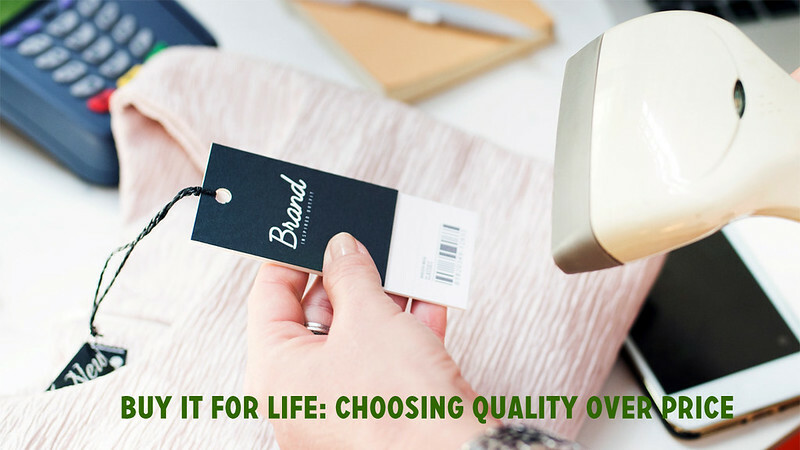 When you’re ready to make a purchase, how can you know which items are quality and which are run of the mill? Sometimes you’ll know which company offers a high-quality version of whatever it is you need to buy, either from personal experience or from paying attention to friends and family. Or, if you don’t know off the top of your head, you know whom to ask for more information. If I wanted to buy audio gear, for instance, I’d ask my brother. He’s an audiophile and could steer me in the right direction. Most of the time, however, you’ll have to do some research. Five stars is equivalent to an A. Four and a half stars is the same as a B. Three and a half stars is a D. I try not to purchase anything rated this low but sometimes there’s no alternative. Three stars and below is the same as an F. I never purchase products rated three stars or below. One final resource for finding quality products is the /r/BuyItForLife forum on Reddit. /r/BIFL allows users to share items they own that are durable, practical, proven, and built to last. Here’s the /r/BIFL compilation of kitchen essentials, for instance. You can find more lists like that in the /r/BIFL sidebar. One GRS reader recently noted that choosing quality over price is a luxury reserved for the rich. People who are struggling to get by are often forced to take the cheapest option, even if it costs more in the long run. That’s an interesting observation. Filson (Seattle, 1897, “Might as well have the best”) sells outdoor clothing, hats, bags, and accessories. I own two Filson hats, a Filson vest, a Filson jacket, Filson pajamas, and several Filson bags. Each piece was spendy but worth it. Filson makes high-quality products. Stickley (New York, 1900, “Collector quality furniture since 1900”) makes classic fine furniture. Much of the modern Get Rich Slowly has been written from a Stickley Morris recliner. During the depths of the Great Recession — just after I sold this blog — I purchased four Stickley pieces at deep discounts. I love them. This list isn’t intended to be comprehensive. These are the companies I know and have used in the past. I’m sure I’ve left out plenty of fine places. If there’s a firm you feel ought to be included in this list, let me know in the comments. I had lunch with my cousin yesterday. When I told him I was writing this article, he shared his experience looking for quality clothing. He recently lost a lot of weight and had to replace his entire wardrobe. See also: How to shop at thrift stores for quality clothing over at The Luxe Strategist. As I was preparing this piece, it occurred to me that I ought to ask folks on Facebook and Twitter where they go to find the good stuff. When do they choose to “buy it for life”? I received a lot of responses! 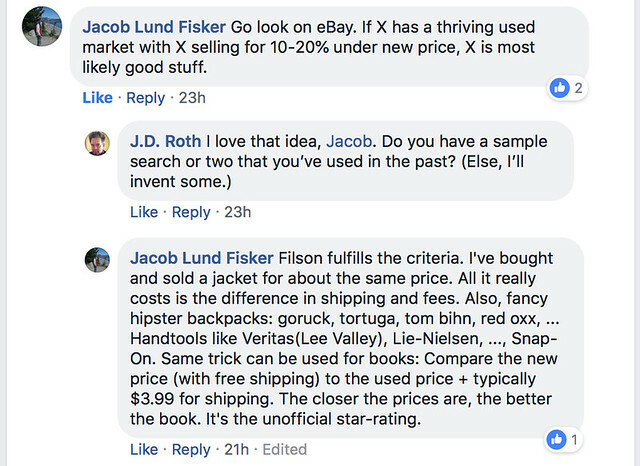 Jacob from Early Retirement Extreme had some good advice for determining whether any given item is considered quality by the people who own it: Check eBay to see if it’s retained its value. I took the time to sift through the roughly one hundred replies I received on social media. While this was by no means a scientific survey, the responses were interesting. First, it’s clear that people are willing to pay a premium for certain classes of products. People are also willing to pay more to ease life in the kitchen. Several people raved about their Vitamix blenders. Mostly, though, folks mentioned their knives. I own (and love) a chef’s knife from Shun, as do a couple of other readers. Others, like my ex-wife, prefer Henckel knives. Justin from Root of Good offered an awesome alternative. His family buys Kiwi knives from Thailand at $3 or $4 each. (They go for $9 on Amazon, which is still a great deal.) All knife lovers agree on one thing: The best way to make your life easier is to sharpen your blades! Lastly, outdoor gear proved popular in my poll. Many people like Arc’teryx (a brand I’ve never tried). Others praised Patagonia or REI or L.L. Bean. Some readers zeroed in on very specific items. Whitney Hansen, the Money Nerd, likes a particular “adventure blanket”. Long-time reader Tyler K says Benjamin Moore paints are so amazing that he’ll never buy paint from a hardware store again. Another reader recommended Casio G-Shock watches. Several people were fans of Hydro Flask. (Me too! I own three of their water bottles and think they’re amazing.) And a lot of people seem to think Otter Box phone cases are essential. But can you guess the number-one company that GRS readers turn to for quality products? It’s the biggest tech company in the world: Apple. Apple didn’t used to be known for quality. (In fact, their quality was crap twenty years ago.) Now, though, things have changed. Apple quality has won converts like me — and you. Finally, several people mentioned that they do their best to buy products with lifetime warranties. Then, if they break or something goes wrong, they can get a replacement. 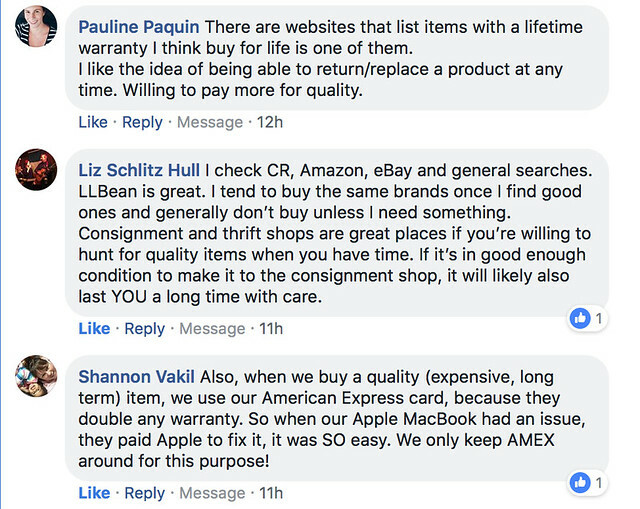 (Leah Ingram maintains a list of companies with lifetime warranties.) By purchasing items with a lifetime warranty, you’re making certain that “buy it for life” is literal, not figurative! One follower on Twitter took me to task for tackling this topic. He believes that talking about spending more to purchase quality items is tantamount to encouraging consumerism. Like I said the other day, I do sometimes worry that this sort of thing crosses the line to lifestyle inflation. Most of the time, however, I think choosing quality is a smart financial decision. Meanwhile, Liz from Frugalwoods has written in the past that the “buy it for life” philosophy can be problematic. If you’re buying the best of everything, that’s an issue. You should only buy the best when thing your buying is an important part of your lifestyle. (Why spend a ton on something you rarely use?) And what about changing fashion and priorities? I believe that buying well-made things, things that “spark joy” when used, is part of living a Rich Life. Most of us don’t aim to be ascetics. We’re not frugal for the sake of frugality. We’ve scrimped and saved and worked hard to build wealth precisely so that we can spend money on products that make our lives easier and/or more enjoyable. There’s nothing wrong with that. Note: This is a substantial re-write of an article I first published more than twelve years ago. (Yikes, I’m old!) I’ve opted to keep some of the older comments if they had good suggestions.